(by Lamine Chikhi, Hamid Ould Ahmed, Reuters) ALGIERS — Hundreds of thousands of protesters demanding radical change marched through Algiers for a seventh successive Friday, as Algeria’s spy chief was reportedly fired in a further sign of high-level turbulence after the longtime president resigned. The demonstrators are pushing for the removal of what they see as an outdated and opaque political apparatus, built around the ruling party, army officers, businessmen, unions and veterans of a 1954-62 independence war against France. “We want a new generation to govern this wealthy country and to secure a better future for the people,” said 80-year-old woman Yamina, standing with her five grandchildren as crowds jammed downtown streets. “We want to uproot the symbols of the system,” said teacher Ahmed Badili, as hundreds of people waved national flags from the balconies of buildings. Others handed out sweets and bottled water. The intelligence chief, retired army general Athmane Tartag, was a close ally of President Abdelaziz Bouteflika, who quit on Tuesday under pressure from the army. The military said it was acting in the national interest after weeks of largely peaceful anti-government demonstrations. Western powers are eager for stability in the OPEC oil producer, Africa’s largest country by land mass and a key gas supplier for Europe and partner to fight militants. Bouteflika’s departure has not eased tensions despite the appointment of a caretaker government which will stay in office until elections in three months’ time. 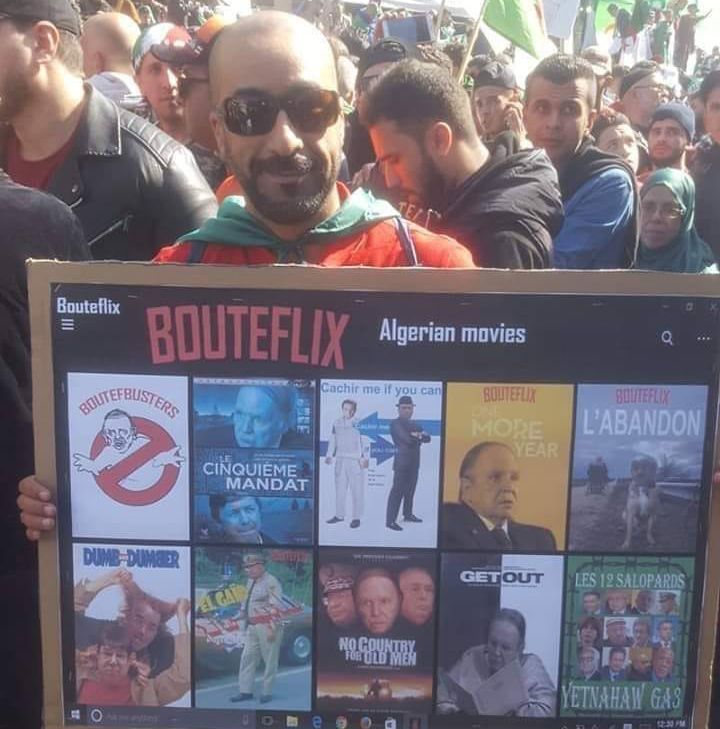 Protester holds satirical poster of President Boutefllika starring in various movies. This Friday, protesters pushed for the removal of Prime Minister Nouredine Bedoui, upper house of parliament chairman Abdelkader Bensalah, and Tayeb Belaiz, head of the constitutional council — all seen as establishment figures. In the weeks before his resignation, Bouteflika’s inner circle had already been depleted by the exit of several close allies from influential positions in politics and business. Tartag’s departure was reported by the private Ennahar TV, and two political sources confirmed that he had been sacked. Ennahar added that his position would return to the supervision of the defense ministry, rather than the presidency, a move that appears to strengthen the army’s hand. The intelligence service has in the past been an important part of the military’s influence in national affairs, and played a backroom role in politics as well as in the 1990s civil war. But in 2016, Bouteflika removed it from the supervision of the defence ministry and placed it under the authority of the presidency to try to ease it out of the political sphere. Protesters want to remove any traces of the old guard and introduce sweeping democratic reforms. But no clear successor to Bouteflika has yet emerged and Algeria’s opposition is fragmented. The uncertainty means the army is likely to continue playing its role as kingmaker with little resistance, guiding the sensitive transition process. Some protesters saw humour in Algeria’s crisis: “Any country interested in toppling its system, we are ready to help. Please send a copy of the constitution. You also need an appointment and we only work on Friday,” read one banner. Writing by Michael Georgy. Published at Reuters .com on April 5. Reprinted here for educational purposes only. May not be reproduced on other websites without permission from Thomson Reuters. b) For how many years did President Abdelaziz Bouteflika rule Algeria? c) What do the protesters want? For what reason do they make these demands? Pressure had been building since February, when the first demonstrations were sparked by President Bouteflika's announcement that he would be standing for a fifth term. Tens of thousands protested across the country on March 1. President Bouteflika's promise not to serve out a fifth term if re-elected, along with a change of prime minister, failed to quell the discontent. Leaders of the protests also rejected Mr. Bouteflika's offer this week that he would go by the end of his current term - April 28 - as not quick enough. (Following six weeks of peaceful protests) the powerful military agreed. Its chief, Lt Gen Ahmed Gaed Salah, said on Tuesday: "There is no more room to waste time." Mr. Bouteflika resigned on Tuesday but that was not enough for protesters. The demonstrators are pushing for the removal of three people they dub the "3B." That is Senate Speaker Abdelakder Bensalah, head of the constitutional council Tayeb Belaiz and Prime Minister Noureddine Bedoui. But they want much more than that - they want to dismantle the whole political system. Specifically, one of the leading voices of the protest movement, lawyer Mustapha Bouchachi, told AFP news agency that he doesn't want the "symbols of the regime" to run the next election.